Large square bales are susceptible to greater storage losses than small square bales formed at the same moisture. This is primarily due to the greater density and volume of large square bales. Methods to improve the storage characteristics of large square bales were investigated: treatment with propionic acid and formation of a ventilation hole through the bale center. Bale moisture ranged from 14 to 28% (w.b.). Ventilated bales did not produce evidence of less heating in storage compared to the control treatment. Also, ventilated bales generally produced a similar change in the ratio of bound protein, indicating similar heat damage to the control. When bale moisture was relatively high, treatment with 0.8% propionic acid produced less bale heating and less heat damage to proteins compared to the control. Neither of the preservation techniques produced a significant trend toward reducing DM loss compared to the control. In three of four trials, bales with a ventilation hole had numerically lower DM loss compared to the control. In three of four trials, bales treated with propionic acid had numerically higher DM loss compared to the control. Bales treated with propionic acid maintained higher moisture during storage compared to other treatments in three of the four trials. This may have led to a longer period of biological activity and masked the benefits of suppressed microorganism activity from the acid treatment. Increased bale DM loss and reduced quality were related to initial bale moisture. 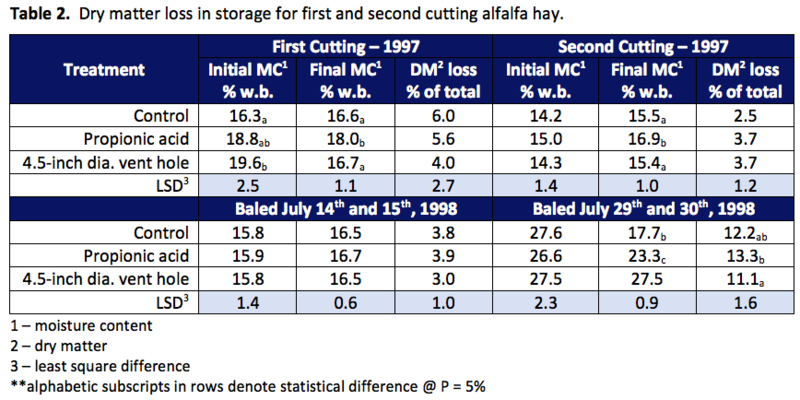 The key to maintaining bale quality and keeping DM loss below 4% was baling at moistures below 16% (w.b.). North American sales of large square bales have been increasing steadily throughout most of the 1990’s. Large square bales have three basic cross-sections: 3’ x 3’, 3’ x 4’ or 4’ x 4’. The bigger cross- section balers are used almost exclusively in the arid western US for commercial hay production. The 3’ x 3’ balers are ideal for hay and forage producers east of the Mississippi River because bale mass and size are more manageable for smaller farms which may be limited in handling capability and livestock facility layout. Large square balers have greater productivity and produce lower field losses than either large round or small square balers (Shinners et al., 1996). Large square bales formed in arid regions typically have very low moisture so that the bales tend to be very stable during storage. As more of these bales are formed in humid regions, storage problems have been noted. an energy source for microbial respiration. The chemical reaction of respiration involves the conversion of carbohydrates and oxygen into carbon dioxide, water and heat. This conversion of carbohydrates results in dry matter loss and increased bale temperature. This rise in bale temperature can have a detrimental effect on bale quality by binding proteins to fiber and rendering these proteins unavailable to the animal (Yu, 1977). Shinners et al. (1996) found that 3’ x 3’ square bales exhibited greater heating, had greater DM loss and were removed from storage with lower quality than small square bales at similar moistures (16 to 21% w.b.). This difference in storage characteristics was thought to be due to the greater amount of dry matter (DM) and carbohydrates available in the high-density large square bale, which produced greater microbial activity and heating. Hay producers often use chemical preservatives to reduce storage losses, the most common of which is propionic acid. Propionic acid is intended to suppress microbial growth and reduce heating from respiration. Typical application rates are 0.5 to 2% by mass. Rotz et al. (1991) found propionic acid treated hay at high moisture (22 to 26% w.b.) had greater DM and nutrient loss after six months in storage compared to a typical low moisture system (11 to 15% w.b.). Rotz et al. (1992) also did not find economic justification to treating high moisture hay (20 to 28% w.b.) with propionic acid compared to the conventional low moisture system. However, there is a lack of research concerning bale storage characteristics of large square bales in the range of 15 to 22% moisture (w.b.) treated with propionic acid. It is very common for producers in humid regions to apply 0.5 to 1% propionic acid by mass when baling with a large square baler (Roberts, 1998). There has been recent interest in the use of a hole in the center of large square bales to create an escape for bale moisture and heat. This idea is not new, as Rotz et al. (1993) reported that bale manufacturers experimented with such a concept on small square balers up to 50 years ago. In the past, devices designed to form a center ventilation hole typically consisted of a spear that was fixed to the small square baler plunger. As each slice of the bale was formed, the conical spear would compress a 2-inch hole in the slice. Rotz et el. (1993) found that small square bales formed with such a ventilation hole did not reduce heating during storage nor improve bale quality out of storage. However, DM loss was slightly less in the ventilated bales and bound protein was also slightly less. Another approach to forming ventilation holes in the center of the bale involves placing a cutting or boring device on the plunger face (Stromer and Winston, 1994). A cut hole may have advantages over a compressed hole because hay at the extremities of the hole would have the same density as the rest of the bale as opposed to the compressed nature of the edge of a hole formed by a spear. The boring device described in this patent had a hollow boring tube with a cutting tip at the leading edge. An auger was placed at inside the tube to pull the cut plug from the tube to prevent blockage. Both the tube and the auger are power with a hydraulic motor. The specific objectives of this research were: (1) To investigate methods to improve the storage characteristics of large square bales in a humid climate, specifically through treatment with propionic acid and formation of vent holes in the bale center, and (2) to determine if any practical limitations exist concerning the handling and storage of large square bales with a ventilation hole. each treatment. Propionic acid was applied through five spray nozzles located above the baler pick-up. A propionic application rate of 0.3, 0.5 or 0.8% was used when bale moisture was below 19, 19 to 23 and above 23% (w.b. ), respectively. Moisture was estimated using a Delmhorst model F-2000 hand-held conductance moisture sensor. When propionic acid was to be applied, the applicator was switched on and the first bale out of the baler discarded to ensure that equilibrium conditions were obtained. Likewise, when the applicator was turned off, the first bale without propionic acid applied was also discarded. All bales were removed from the field, transported to the storage area and stored under cover the evening after baling. Boring of the vent holes in randomly selected bales began immediately the morning after bale formation. Total time to select, set-up, bore and remove a bale was approximately 20 min. Therefore, a complete set of bored bales was accomplished within 24 h of baling. All bales were placed into storage the day following boring (i.e. within 48 h of formation). Twelve bales from each treatment were stacked two across by two deep by three high. Each stack of 12 bales was surrounded on four sides by small square bales that had been in storage for about one year. A vertical channel was formed between bales with vent holes by leaving a gap of about 8 inches between each bale or the adjacent buffer wall. All bales were stored in an open-front hay storage structure. All bales were weighed and cored sampled into and out of storage. Thermocouples were placed in four bales per stack to monitor bale temperature. Bale storage characteristics were quantified by DM loss, level of bale heating and changes in bale nutrient quality. Nutrient samples were analyzed using near-infrared spectroscopy (NIRS) by the University of Wisconsin Soil and Plant Analysis Laboratory for crude protein (CP), acid-detergent fiber (ADF), neutral-detergent fiber (NDF) and acid-detergent insoluble protein (ADIP). Initial bale moisture had a great effect on level of heating in the bale (table 1). When bale moisture was less 16%, average bale temperature was relatively low (2nd cutting, 1997). When bale moisture was greater than 25%, bale temperature exceeded 35°C (the level at which heat damage to proteins is excessive) more than 30 days for all treatments. Application of propionic acid at 0.5% did little to reduce the level of heating when bales were between 16 and 19% moisture (table 1). In this case, the control bales were several points lower in moisture than either other treatments and this probably is the reason that the control bales exhibited less heating. Application of propionic acid at 0.8% did reduce the level of heating when bale moisture was greater than 25% (figure 1). Bale moisture significantly affected the level of DM loss experienced with large square bales where greater bale moisture generally resulted in greater DM loss (table 2). Considerable variation existed in the storage DM loss results so that there were no significant differences in DM retention between treatments in three of four trials. However, in three of the four trials, there was a trend for the bales with the vent hole to have lower DM loss than the other treatments. Bales treated with propionic acid had the numerically highest DM loss in several trials. Crude protein (CP) concentration was generally not affected by any of the treatments (Shinners, 1999). The main energy source for microbial action is carbohydrates and CP is usually consumed at a lower rate. The loss of CP is greater over 6 to 9 mo. of storage than with a shorter storage period because as storage proceeds, the rate of carbohydrate loss declines but CP loss continues (Rotz and Muck, 1994). In this study, bales were in storage for a maximum of 4 mo., which could account for the low CP loss. Neither NDF or ADF components are lost during storage, but DM loss in storage is mainly soluble carbohydrates. Therefore, the increase in fiber concentration as measured by ADF and NDF concentration is due to DM loss. The average ADF retention ratio (ADFout/ADFin) across the four trials were 1.05, 1.05 and 1.03 for the control, propionic and ventilated treatments, respectively. The average NDF retention ratio (NDFout/NDFin) across the four trials were 1.07, 1.07 and 1.05 for the control, propionic and ventilated treatments, respectively. These results would tend to confirm the trends found with DM loss, i.e. that the ventilated bales appeared to reduce bale DM loss compared to the control and propionic acid treatments. Shinners et al. (1996) found ADF and NDF retention ratios of about 1.07 to 1.09 for bales at about 17% moisture (w.b.). When excessive bale temperature occurs due to microbial respiration, protein availability is reduced because some protein can become tightly bound to fiber. This bound protein is unavailable to the animal and is usually measured by acid-detergent insoluble protein (ADIP). The average ADIP retention ratio (ADIPout/ADIPin) across the four trials were 1.22, 1.11 and 1.19 for the control, propionic and ventilated treatments, respectively. The lower ADIP retention ratio for the propionic acid treatment was statistically lower than the other two treatments. Temperature was measured in four bales in each stack and it is possible that heating was lower in these bales than on the remaining eight bales in the stack. Since the ADIP values presented here are an average of samples from all 12 bales in each stack, this parameter might be a better indication of the level of heating for each treatment. 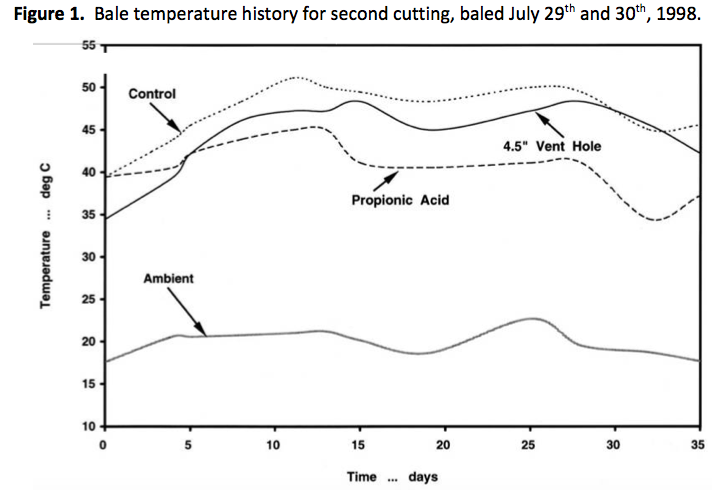 In 1997, first cutting bales treated with propionic acid exhibited higher temperature through the first four weeks of storage and had more days in storage greater than 35°C than the control treatment (table 1). Bale temperature history was similar for all second cutting treatments in 1997 because bale moisture was relatively low (table 1). In 1998, when moisture was relatively high, the propionic treated bales exhibited lower bale temperature than other treatments (table 1). Propionic treated bales produced better ADIP retention ratios than control treatments in two of the four trials, indicating less heat damage when propionic acid was applied at 0.8%. Loss of DM was similar between bales treated with propionic acid and the control treatment for both cuttings in 1997 (table 2). In 1998 when bale moisture was relatively high, the propionic treated bales produced numerically higher DM loss than the control (table 2). Of the four trials, propionic acid treated bales exhibited better fiber retention ratios than control bales only once, indicating similar level of DM loss to the control. Given the lower bale temperatures and ADIP retention ratios found in 1998, it appears that propionic acid reduced the level of bale heating compared to the control treatments. However, there was no trend to suggest that propionic acid produced lower DM loss and improved fiber concentration levels. Rotz et al. (1991) treated small square bales of alfalfa hay with propionic acid at a rate of 1 to 1.5% when hay was in a moisture range of 19 to 22% (w.b.). Rotz et al. found no significant difference between the treated and control bales in terms of heating, DM loss or quality constituent retention after 30 days in storage. Rotz et al. speculated that the hygroscopic nature of propionic acid caused acid treated hay to be consistently higher in moisture than untreated hay, even after six months in storage. This higher level of crop moisture was also speculated to have increased biological activity, which led to similar levels of DM loss despite the presence of acid preservative. In three of the four trials reported here, the final moisture of the propionic treated bales was higher than that of the other treatments (table 2). It may be that the application of propionic acid in the range used here merely slowed the rate of biological activity, but that the overall higher moisture in these bales resulted in a similar extent of activity compared the control treatment. The slowed rate reduced the level of bale heating and protein damage, but also caused the bale to stay at a higher moisture for a longer period and this sustained biological activity for a longer period, creating similar overall storage losses. The presence of a ventilation hole did not significantly improve bale heating characteristics or DM loss compared to the control treatment (tables 1 and 2). However, in three of the four trials, the ventilated bales had numerically lower DM loss than the control (table 2). Compared to the control treatment, fiber concentration was less for the ventilated bales in one trial, was greater in another and similar in the remaining two trials. Evidence of heat damage to proteins was similarly mixed. Hay at less than 15% moisture (w.b.) is relatively stable and little loss occurs from respiration of bacteria, fungi and yeasts (Rotz and Muck, 1994). The longer hay stays above equilibrium moisture, the longer the period of biological activity (Rotz and Muck, 1994). In this respect, the presence of the ventilation hole may have tended to reduce the extent of biological activity by allowing the bale to reach equilibrium moisture more quickly than other treatments. However, the rate of respiration for many microorganisms present in baled hay is enhanced by the presence of oxygen. In this respect, the presence of the ventilation hole may have tended to allow more oxygen to penetrate to the interior of the bale thereby increasing the rate of respiration. When bales with the vent holes were moved, the bale was observed to sag. If the bored bales were moved too roughly with a skid-steer loader, then this sagging would make it difficult to force a slightly undersized pipe through the recently created hole. This tendency for bale sagging to disrupt the integrity of the hole was overcome by always transporting the bale with a pipe placed through the vent hole. This problem could have practical implications because it is certainly not feasible to expect a producer to use a similar support procedure. In the future, it will be important to determine if this concern will still be present when ventilation holes are formed during baling rather than after baling as performed here. Another concern with this process is with the gap left between adjacent bales to create a vertical ventilation channel between stacks. Leaving a gap of 8 inches between adjacent bales would reduce the number of 8 foot bales that could be placed in a storage structure by about 8% (loss of 1 full stack for every 12 that normally could be placed in storage). This would negatively affect the economics of the cost of storage per unit mass. Also, this gap makes the created stacks less stable because there is no shared support between stacks. Ventilated bales did not produce evidence of less heating in storage compared to the control treatment. Also, ventilated bales generally produced a similar change in the ratio of ADIP (bound protein), indicating similar heat damage to the control. When bale moisture was relatively high, treatment with 0.8% propionic acid reduced bale heating and produced less heat damage to proteins compared to the control. Neither of the preservation techniques produced a definite trend toward reducing DM loss compared to the control. In three of four trials, bales with the ventilation hole had numerically lower DM loss compared to the control. In three of four trials, bales treated with propionic acid had numerically higher DM loss compared to the control. Neither of the preservation techniques produced a definite trend toward reducing fiber concentration (ADF, NDF) compared to the control. Bales treated with propionic acid maintained higher moisture during storage compared to other treatments in three of the four trials. This may have led to a longer period of biological activity and masked the benefits of suppressed microorganism activity from the acid treatment. Increased bale DM loss and reduced quality were related to initial bale moisture. The key to maintaining bale quality and keeping DM loss below 4% was baling at moistures below 16% (w.b.). Buckmaster, D.R., C.A. Rotz and D.R. Mertens. 1989. A model of alfalfa hay storage. Transactions of the ASAE 32(1):30-36. Nelson, L.F. 1966. Spontaneous heating and nutrient retention of baled alfalfa hay during storage. Transactions of the ASAE 9(3):509-512. Roberts, J. 1998. Baling quality hay with large package square balers. Harvest Tec, Hudson, WI. Rotz, C.A., R.J. Davis, D.R. Buckmaster and M.S. Allen. 1991. Preservation of alfalfa hay with propionic acid. Applied Engineering in Agriculture 7(1):33-40. Rotz, C.A., D.R. Buckmaster and L.R. Burton. 1992. Economic potential of preserving high-moisture hay. Applied Engineering in Agriculture 8(3):315-323. Rotz, C.A., T.M. Harrigan and R.J. Tilloson. 1993. Hay preservation in ventilated bales. Proceeding of the 1993 Annual AFGC Meeting, pages 112-116. Rotz, C.A. and R.E. Muck. 1994. Changes in forage quality during harvest and storage. In G.C. Fahey (ed.) Forage quality, evaluation and utilization; American Society of Agronomy, Madison, WI. Stromer, V.D. and H.R. Winston. 1994. Hay bale aerator. US Patent Number 5,301,607. Shinners, K.J., R.J. Straub, R.L. Huhnke and D.J. Undersander. 1996. Harvest and storage losses associated with mid-size rectangular bales. Applied Engineering in Agriculture 12(2):167-173. Shinners, K.J. 1999. Evaluation of systems to improve storage characteristics of large square bales in a humid climate. ASAE Paper Number AMC-99-102 presented at the 1999 Agricultural Machinery Conference, Cedar Rapids, IA. Yu, Y. 1977. Effect of heating of forages on quantitative changes of acid-detergent insoluble nitrogen. J. Dairy Sci. 60:1813-1815.